I535VRUDNE1 Android 4.4.2 KitKat Firmware Last Updated on 26-June-2014. Verizon Samsung Galaxy S3 SCH-I535 (USA Verizon) users can now update their device with the latest VRUDNE1 Android 4.4.2 KitKat official firmware. Samsung recently started rolling out an OTA update about the firmware. The latest firmware build version number is I535VRUDNE1. The device has been running on Android 4.1.2 JB from a long and later updated to Android 4.3 Jelly Bean. This is the first official Android 4.4.2 KitKat firmware update for SCH-I535. If you own the device and not yet updated this latest firmware, then update the same using our simple tutorial below. The below guide will help you to download and install the I535VRUDNE1 Android 4.4.2 KitKat Firmware manually through Odin. If you already updated the I535VRUDNE1 firmware and looking for an easy to follow method to root the firmware, then follow this guide- Root I535VRUDNE1 Android 4.4.2 Stock Firmware On Verizon Galaxy S3 SCH-I535- Simple Tutorial. The latest Android 4.4.2 KitKat is definitely a great update for the Verizon Galaxy S3 SCH-I535 users. The latest firmware will upgrade the OS version to 4.4.2 KitKat and will bring many new features and performance tweaks. 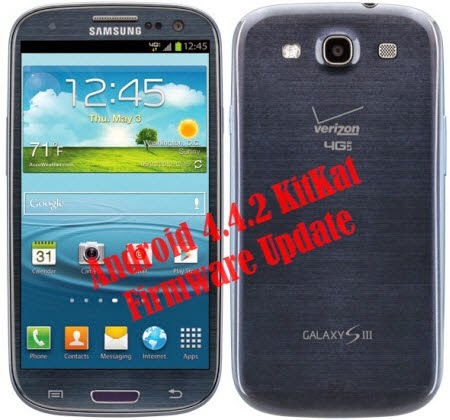 So, want to update your Galaxy S3 I535 to the latest I535VRUDNE1 Android 4.4.2 KitKat firmware? For official way, either you can go for OTA (over the air) from Settings-About Phone-Software Update or download firmware through the Samsung Kies utility. However, most of us prefer manual way to update official firmware. So, in this article you’ll find step by step manual guide to update the latest Android 4.4.2 VRUDNE1 firmware on your Galaxy S3 I535 through Odin. All the above pre-requisites are very important and must follow before proceed to installation guide. Hope you get all the above points. Now, go through the below tutorial to install Android 4.4.2 I535VRUDNE1 official firmware on Galaxy S3 I535. So, you have just finished the tutorial to update Android 4.4.2 KitKat official firmware on Galaxy S3 SCH-I535. If you followed everything as mentioned in the above tutorial, then your device should now running on the latest Android 4.4.2 Jelly Bean build version VRUDNE1. You can verify the firmware update details from Settings-About Phone. So, enjoy all the new features and improvements on your device and don’t forget to share your experience in the comment below. The I535VRUDNE1_I535VZWDNE1_VZW.zip cannot be downloaded - gets you to some bogus sammobile fileshare site, and it does not work. Need to join Sam Mobile to download. I did as outlined and it worked perfectly. Hi everyone.....I have VZW Galaxy S3 (World Phone) work on GSM all Bands and 3.5G HSPA+ 2100 bands "about Phone" the baseband version is i535xxxxx/ Model SCH-i535 but under the battery its i9300, imei number same on sticker and in "about". i wonder what is it..??? and can i install official ROM ( On KIES a new firmware is available ) ( Current vrz : PDA:NC1 / PHONE:NC1 /CSC:NC1 vzw to update crzn : PDA:NE1 /PHONE:NE1 / CSC:NW1 vzn)..on my device?? i am using this in Pakistan and is there any chance that i might get a country locked phone after installing it.right now my phone is working fine but it`s on android 4.3. if anyone knows please help.